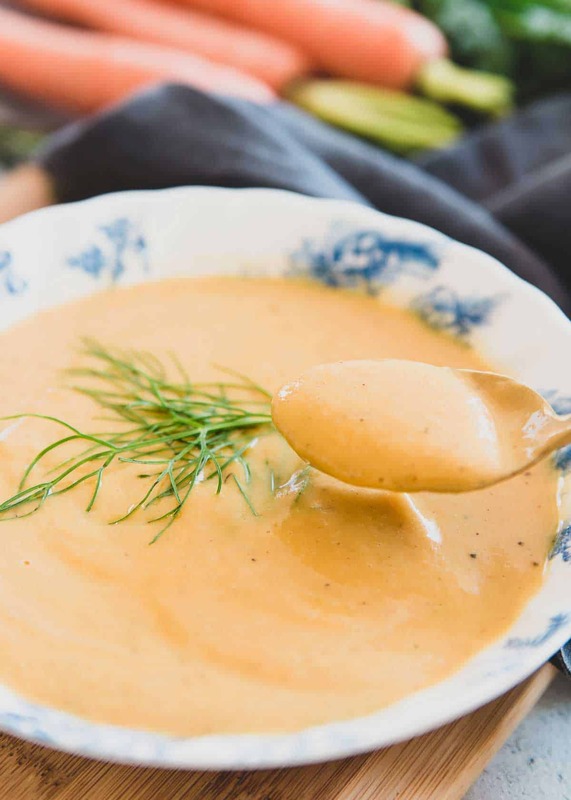 This creamy carrot soup is hearty and filling with cannellini beans yet light and refreshing for spring with fresh fennel. Vegan and gluten-free! With April here and Easter (anyone else thrown off how late it falls this year?) around the corner, carrot soup seemed like a perfectly seasonal recipe to give a whirl, with a twist of course. I don’t pay much attention to carrots usually when it comes to being the star ingredient in a recipe save for these brown sugar candied carrots (which are such a lovely way to highlight tender baby spring carrots), carrot chips or this really delicious carrot salad but I think if there was a vegetable to represent the month of April, they might be it. 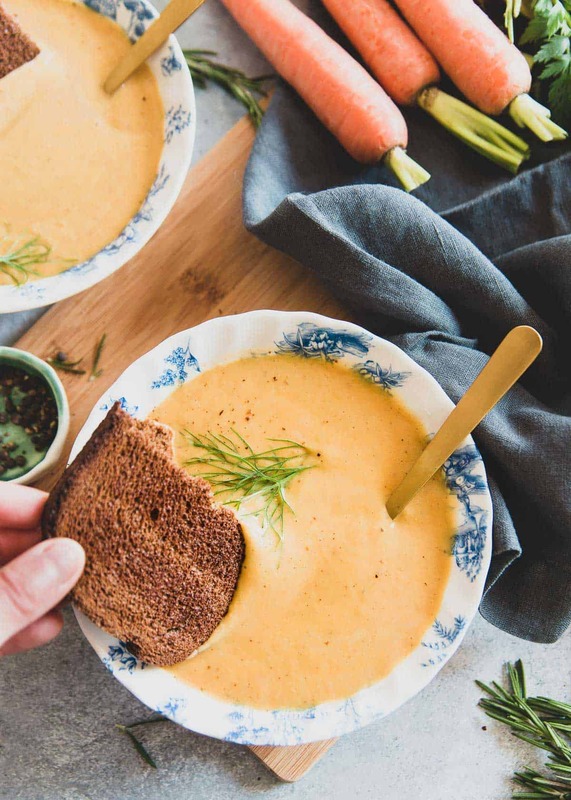 The internet is definitely not lacking in carrot soup recipes but with the addition of creamy cannellini beans and refreshing fennel, this easy version made in just about 30 minutes is a worthy addition. 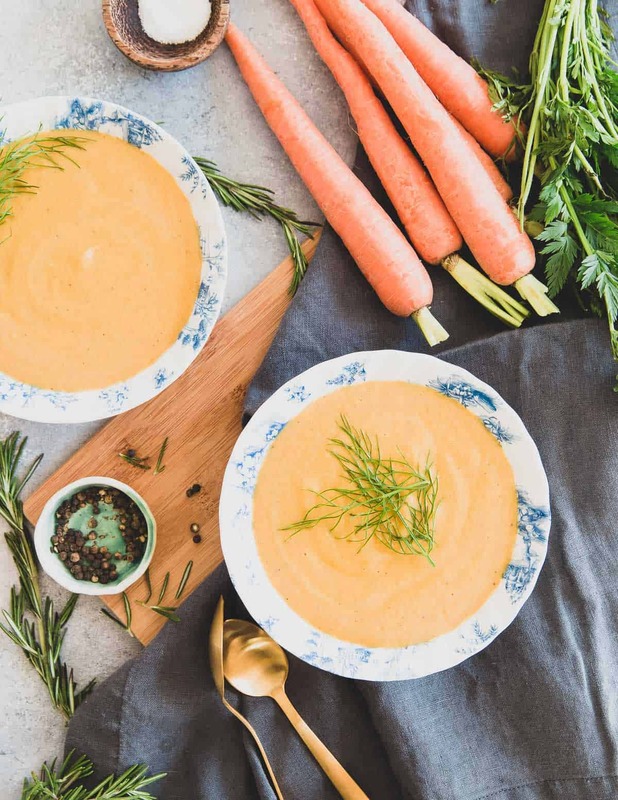 It’s a creamy and hearty carrot soup with an undertone of fresh spring flavor, not too heavy, not too light and perfect for these early spring days. The first time I made this soup, I had a slight mishap with my pepper mill (aka it broke over the soup pot and all the peppercorns dumped straight into the soup). Despite my valiant (and time consuming attempts) to fish as many out as possible I ended up with a pretty spicy carrot soup recipe. So, I made it again and this time the outcome was exactly what I was envisioning: a thicker, creamy soup thanks to the white beans with a slight hint of fennel but a predominantly carrot-forward spring flavor. It’s exactly what I want to eat when the days are warm enough for walks without jackets but the nights still require the heat to kick on. This is a simple carrot soup recipe that comes together on the stove top in just about 30 minutes. just until they’re slightly softened. Then the beans and broth get added to simmer everything until fork tender. At this point, the soup is pureed until creamy and smooth. You can do this in batches in your blender (I use my Vitamix) or use an immersion blender right in the pot off the heat. Once the soup is pureed, pour it back into the pot and stir in the almond milk soup base for a lovely pale orange color and extra creaminess. You can also use regular unsweetened almond milk or any milk of your choice. Obviously, if you want to keep the recipe vegan, choose a non-dairy milk alternative. If you want an added decadence to the soup, try whole milk. Garnish on soup might be almost important as the flavor of the soup itself in my opinion. No good soup is without a pretty garnish! I like using the fennel fronds for garnish on top of the carrot white bean soup. They add a nice pop of green color and give you an idea of what other flavors to expect in the recipe. Fresh chopped rosemary is another option since that herb is used in the carrot soup as well. Feel free to substitute another herb of your choice for rosemary. Thyme would be a lovely option too. I also like serving this soup with some toasted bread. The pumpernickel I had on had was perfect in both flavor and color contrast. A crusty baguette would be just as nice. The phrase “cream of…” whatever soup always grossed me out. It’s got a little too much of a canned Campbells soup vibe for me. But, I have to say if there was a vegan version of a cream of carrot soup, this recipe might be it. 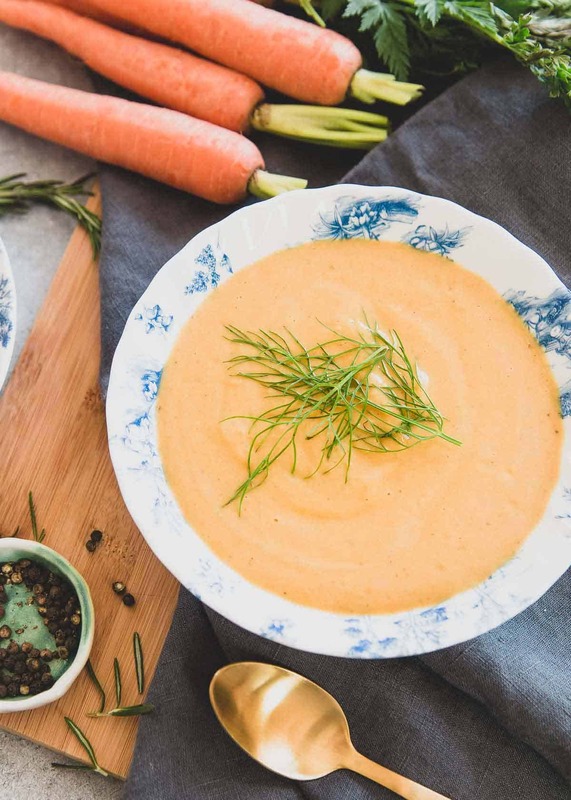 My family tends to make a big deal out of our Easter dinner meal so if yours is like us, consider this carrot soup as an appetizer course (with a big roast to follow of course! ), it’d make the perfect start to a holiday meal. Looking for more recipes like this carrot soup? Once hot, add olive oil, onion, fennel, carrots and rosemary. Cook for 5 minutes minutes, stirring occasionally until onions are softened slightly. Add salt and pepper to taste, beans and broth. Stir to combine, reduce heat to medium-low and simmer, covered for about 20-30 minutes until carrots are fork tender. Puree mixture in batches using a regular blender or an immersion blender (off the heat). Pour the soup back into the pot and add the almond milk. Stir to combine and season with additional salt and pepper if needed. Ladle into bowls, garnish with fennel fronds and serve with toasted bread of choice. This turned out so pretty. And my family loved it! I had to go get some fennel immediately so that I could make it this afternoon. I love dairy so much, and use FairLife whole milk because of their lower sugar level, so of course I used whole milk and it is absolutely delicious. Thank you for this recipe!